Yesterday I was having one of those days. You probably know the kind I am talking about. I was doubting myself. I was even angry with myself, and I was angry with everyone else. I forgot one of the most important things. When I stopped to think, I realized that many of the mistakes I have made in my life are because I didn't listen to my own inner voice. I didn't listen to my gut feeling. I let someone else determine what was best for me. 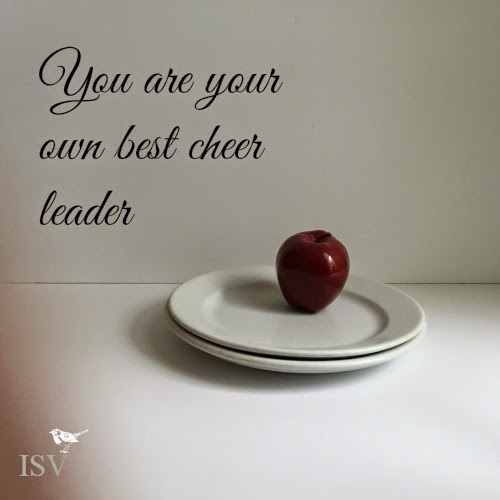 I realized that we all need to keep cheering for ourselves. I hope you will join us tonight and tomorrow for Women Speak when we will talk more about being your own cheerleader. Thanks, Diane. I hope you have a beautiful day, too. Hope you have a better day today, Laura. Knowing that I am a child of the King of Kings is what gives me confidence to get out of bed each morning. and our own worst critic.